This dataset was created as part of the DFG project »METRUM«. For further details, see the project website. The song cycle »Winterreise« (Winter Journey) was composed by Franz Schubert in 1827 (D 911, op. 89), as a setting of a cycle of poems by Wilhelm Müller. It consists of 24 songs for single voice (usually sung by a tenor or baritone) accompanied by a piano. We manually annotated the musical structure of these songs to provide a reference segmentation for all researchers who want to work with this dataset. Furthermore, to enable a deeper view on the data, we present free recordings of the songs together with graphical representations based on several musical aspects. You can download both file types, audio as well as stanza annotations, directly from the demo pages. Please take care of the specific licence for each recording. Furthermore, we will provide our structure annotations for download soon. The songs of Winterreise cycle have different musical forms, from pure stanza songs with little variations to through-composed pieces of music. Principle objective of structure analysis is to detect as much of the underlying structure as possible. Therefore, it is closely related to the segmentation task, which describes a decomposition of a song into musically meaningful components. 3. 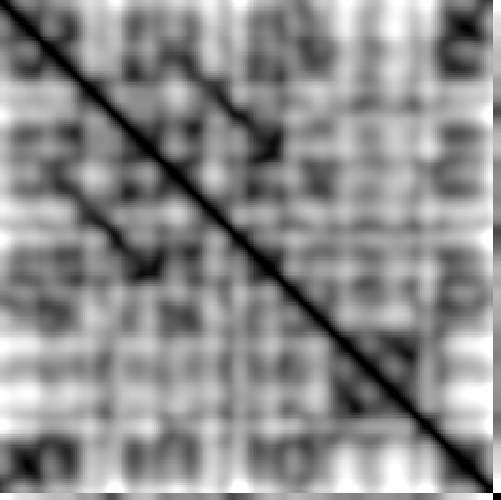 Self-similarity matrix of the feature sequence, 4. Labeled segmentation of the musical piece. In the research field of automatic music structure analysis, we try to derive all high-level structure information from a low-level representation of music, i. e., a single audio file. Mostly, the audio file (or waveform) is converted into a so-called feature sequence first. Features are technical representations of the musical content which are designed to correspond to a specific musical aspect like harmony, timbre, or tempo. By pairwise comparision of the features, a graphical representation called self-similarity matrix (SSM) can be obtained which directly shows some structural information. Many researchers (like us) are interested in finding ways to extract this latent structure information from a self-similarity matrix.